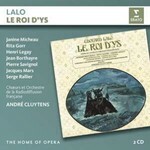 Lalo's Le Roi d'Ys draws on the same Breton myth of a submerged city as Debussy's La Cathédrale engloutie. A great success at its 1888 premiere at Paris's Opéra Comique, it even reached the Metropolitan Opera, New York, but its current rarity on the world's stages makes this classic 1957 recording still more treasurable. The performers' Gallic credentials are impeccable, even though both Rita Gorr and André Cluytens were natives of Flanders. Like soprano Janine Micheau and tenor Henri Legay, Cluytens enjoyed close links to the Opéra Comique, spending six years as its music director.